Century Cycles Blog: Raleigh/Diamondback's gift to Keith makes front page news! Raleigh/Diamondback's gift to Keith makes front page news! 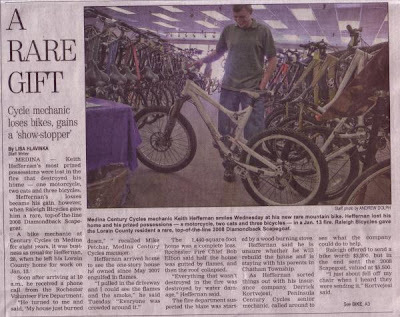 After we posted the video of Keith getting a new bike from Raleigh/Diamondback to replace one of his bikes that was lost in a house fire, the Medina Gazette took an interest and ran this story on the front page of their Friday, February 27, 2009 edition! You can also check out the generous company's own reports on the Raleigh Blog and Diamondback Blog!